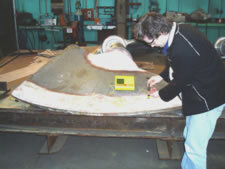 Calspec not only carries out calibration of I, M & T equipment but carries out repairs wherever possible. Shown below is an item of equipment that was manufactured to Calspec design specifications to be used in the strength testing of salmon farm netting either before assembling into fish farm pens or later for netting that has been in use for some time in water. The hand operated tester is capable of reaching up to 300kg without straining. Mild steel, high carbon steel, Cr. Steel, Cr. V. Steel, Cr. Ni. Steel, Cr. Mo. Steel, Cr.-Ni-Mo steel, Cr.-Mn-Si-steel, Stainless steel. 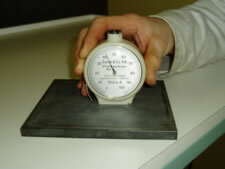 Durometer type A for testing soft rubber and non-rigid plastics and of Durometer type D for harder rubbers and plastics. Today Calspec calibrates equipment for around 100 companies throughout Tasmania on a regular basis.